DISCOVER SAILING! The Hammond Marina Sail-A-Way program is a learn-to-sail program that provides classroom and on-water sailing instruction for both the able bodied and disabled. Sailing is enjoyed aboard uniquely designed Freedom Independence 20-foot sailboats. 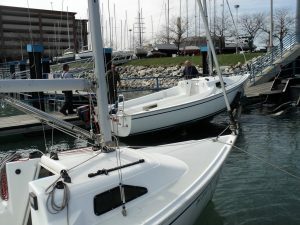 Active students are encouraged to learn to sail independently on Lake Michigan. Contact the Hammond Marina Office at 219.659.7678 for more information on the programs and check the Hammond Marina Sail-A-Way Facebook page for more activities and events. Stay up to date on all the Sail-A-Way (SAW) happenings! Like and share our Hammond Marina Sail-A-Way Facebook page. Advanced Sailing Class is one full day of sailing for students who want to build further on their basic keelboat skills. It is scheduled to start in the morning (9:00 am), and to take better part of daylight time. Class includes Passage planning, reading Nautical Charts, basic Piloting, Port-to Port sailing. Also on the upwind (outbound) leg students learn finer points of Sail Trim and efficient sailing, plus approaching Unfamiliar Harbor. On the downwind (inbound) they learn basics of Spinnaker use.Skipper checkout is pre-requisite for that class. Cost is the same as the regular program. Coastal Navigation Class This wintertime class is designed to give students practical skills necessary to plan a safe passage, calculate Dead Reckoning course, get Position Fixes, then calculate and plot the course on Navigational Charts using Plotting Tools, while taking winds and currents into account. Class is based on ASA 105 course and held entirely in the classroom. The duration is extended to 24-hours to provide ample time for practical chart work. No prerequisite is needed to take the Coastal Navigation class. Starting in May, the Sailing Program will start assembling the sailboats. Come out and see how a sailboat is put together! Please call the Hammond Marina Office at 219-659.7678 for specific dates, times and more information. Beer can racing Wednesday nights starting at 5 pm at the Main Dock. Limited seating is available. Call the Hammond Marina Office at 219.659.7678 or email Ron at rock1852@aol.com to guarantee your spot!